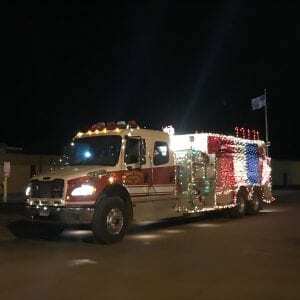 Downtown Main Street was abuzz with children and people of all ages who anxiously awaited the start of the annual Parade of Lights in Eagle Butte on Saturday, November 24. 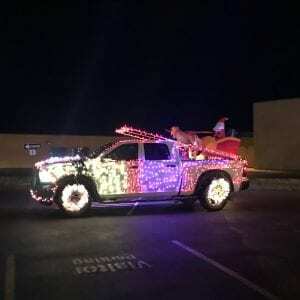 Twelve brightly lit floats were entered into the parade, each with their own theme and holiday message. Inflatable characters and decorated trees leaned to and fro in the winds, and loud Christmas music played over the speakers as the parade made its way down Main Street. 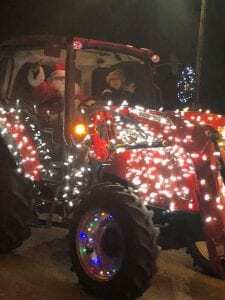 Spectators were treated to candy from the floats and children in the crowd waved to Santa Claus, who rode on the Lakota Thrifty Mart float. After the parade, volunteers helped served chili, hot chocolate, coffee, and handed out candy bags to children at Landmark Hall. 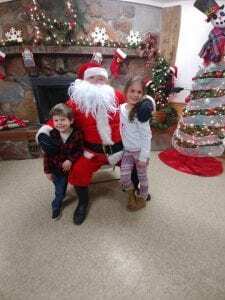 Over 350 people stopped by the hall to enjoy the free meal and chance to meet Santa Claus.